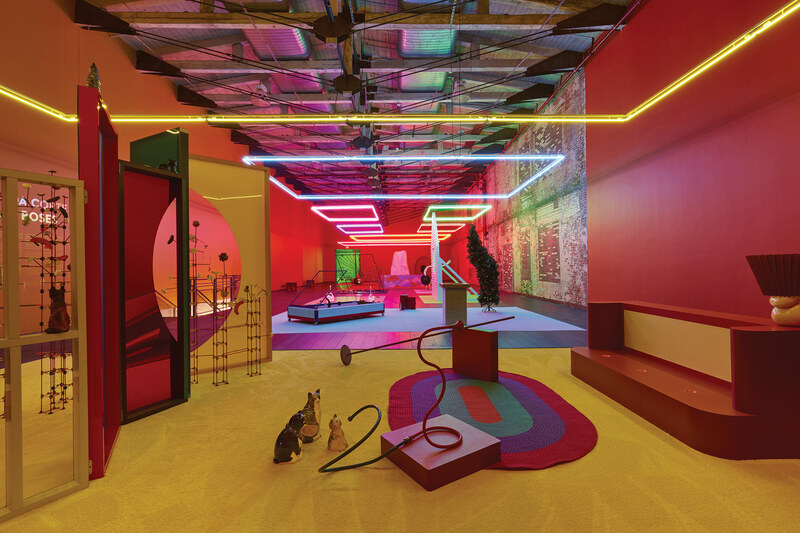 Artist Alex Da Corte wants you to be scared. 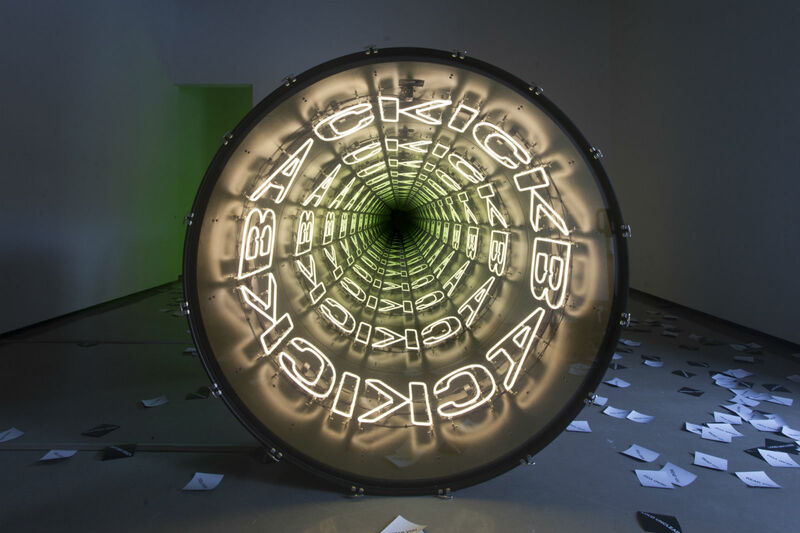 In C-A-T Spells Murder, a new show at New York's Karma, the Philadelphia-based artist deploys neon sculpture, video, and neon painting to muse on the feeling of fear and its effects on perception. Slow Web, pictured above, uses common building materials like vinyl siding and plywood to foreground a luminous orange neon spider's web, creating an homage to a classic symbol of creepiness. The web is partially detached from its frame, drifting off to the left. How did it break free? Is there a ghost in the house or was that just a strong, cold breeze? Another work, Good Window with Candle (Purple), pictured below, uses the same materials as Slow Web, but the shutter-flanked candle beneath an open double-hung window feels more solitary than sinister. The exhibition, which runs through March 18, is accompanied by a book of short but spooky stories and stories to bring the eerieness out of the gallery and into the world. C-A-T Spells Murder is up through March 18 at Karma's East Village gallery (188 East 2nd Street). More details on the show and hours of operation can be found here. By the New York Times' estimate, there are some 12,000–17,000 water towers currently in use within New York City. Frequent hosts for sediment and even harmful bacteria, Ivan Navarro has found a new substance for filling these ubiquitous components of the city skyline: neon light. 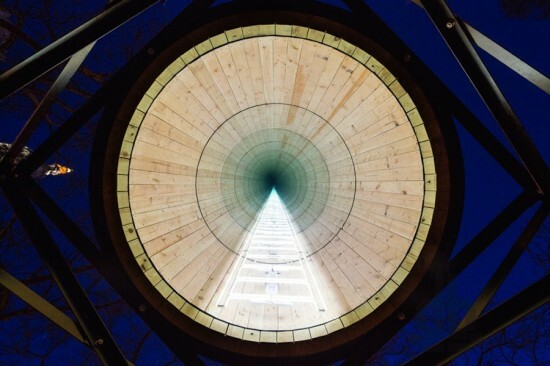 The material is the Chilean artist's preferred medium, and in a new installation in Madison Square Park he has rendered the words "we" "me", and a ladder on the interiors of three separate water towers. Elevated eight feet above the ground, each of the towers is devoted to one of the aforementioned images. Viewed from below the images appear to extend into infinity. The piece is obtusely title This Land is Your Land (by way of Woody Guthrie) and will be on display through April 13.